Just picked up the Wolverine Annual with The Death Song Of J. Patrick Smitty written by Gregg Hurwitz. It’s a crime fiction tale with Wolverine in it. The story of a loser who has continuing bad luck. 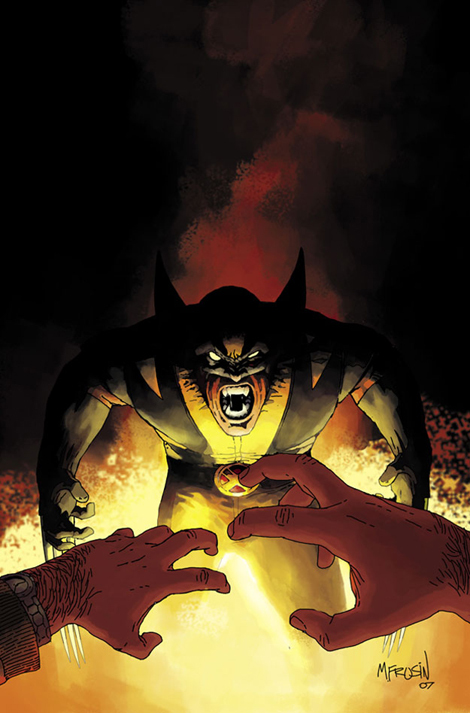 He ultimatley ends up on the wrong side of Wolverine and it’s a combination of flashbacks of how he got there and present day Wolverine coming for him. Great story and the art from Marcelo Frusin fit it perfectly. Some of the best Wolverine I’ve read in a while. The MAX sampler is also out with a preview of the Foolkiller from Hurwitz. It looks great. Mini interview is also good stuff. Also included, preview of Duane Swierzinski’s Punisher Annual and an interview. Some of my favorite crime fiction guys writing some of my favorite comics characters. I absolutely LOVE Wolverine ever since I came across the character. If you haven't yet, read "Origins." It was amazing, after all these years they finally revealed his origin and it didn't disappoint. I'm stopping buy the comic store today to pick this up. I check out the other stuff too, and I've heard the Program is good too. Gregg also has some amazing novels. His latest, CRIMEWRITER is really great. I also loved THE PROGRAM. Never read any of Gregg Hurwitz stuff, but from what you've described on this book I need to pick it up. I haven't read any good wolverine books in a long while. Some of the new stuff they're doing with him isn't all that great, so I generally stick with books that I know will be good. This sounds promising.